We've made it a priority at Brightcove to help our publishers deliver video to all three screens: the PC, connected TVs, and mobile devices. Using Smart Players, our customers' videos will playback in mobile browsers on any device, whether it's a Flash-based Android device or an HTML5-based iOS iPhone or iPad. We've also helped our publishers ramp up their own mobile app development with useful SDKs and sample applications for Android and iOS devices. 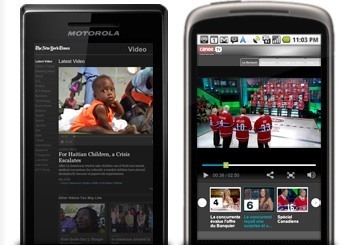 Mobile devices represent a large and growing percentage of viewers. This session will cover building, styling and publishing a video centric application for the iPhone, android and mobile web! This is a Brightcove-led session with Jesse Streb. This customer and partner-led session features presenters from Cantina Consulting and Rogers Digital Media. This session will cover four areas that you should pay attention to when caring and feeding your mobile apps with content: analytics, data, advertising and promotion. Led by Brightcove's Ashely Streb. No matter if you are a mobile app developer or a marketer concerned with reaching your mobile aduience, there's something for you at Brightcove PLAY. Register today. There are just 9 days before the early bird registration rates expire!